Considering all the security, availability and flexibility we can achieve today with cloud-based assessment management systems, it’s remarkable to look back at the many changes and milestones we’ve seen over the past 25 years. I wrote the first version of Question Mark for DOS in 1987-88. When I launched the company, 25 years ago, in London in August 1988, I always wanted to bring the benefits of computerized assessment to the world, but it was hard to foresee the dramatic technological changes that would transform our industry and make online assessment as widespread as it is today. Coinciding with the rise of the PC, Question Mark for DOS empowered trainers and teachers to create, deliver and report on computerized assessments without having to rely on IT specialists. The switch to a visual user interface was huge, but the biggest paradigm shift of all was the move to delivering assessments over the Internet. Pre-Internet, communicating results from assessments at a distance meant sending floppy disks by post. The World Wide Web made it possible to put an assessment on a web server, have participants answer it online and get instantly viewable results. This changed the world of online assessments forever. 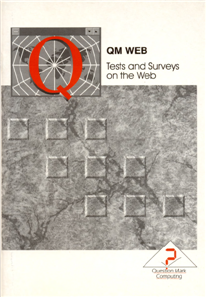 Questionm ark Technical Director Paul Roberts, who still plays an important role in Questionmark product development, wrote the code for the world’s first-ever Internet assessment product, “QM Web”, in 1995. We followed up QM Web with the first version of Questionmark Perception, our database-driven assessment system, in 1998. Eric Shepherd founded the U.S. division of Questionmark in the 1990s and in 2000 became CEO of what is now a global company. He is the heart and soul of Questionmark, an inspiring chief executive who has turned Questionmark from a small company into an industry leader. One key paradigm shift in the 2000s was the desire to use surveys, quizzes, tests and exams in more than one department — across the entire enterprise. To make this practical, we began building scalability, reliability, translatability, accessibility, maintainability and controllability into our technologies. These attributes, along with multiple delivery options and in-depth reporting tools, are key reasons people use Questionmark today. In recent years, we’ve seen another dramatic change – towards software-as-a-service applications in the “cloud”. Just as Question Mark for DOS 25 years ago empowered ordinary users to create assessments without needing much IT support, so Questionmark OnDemand today allows easy creation, delivery and reporting on assessments without in-house servers. So what’s in store for the future? Technology is making rapid advances in responsive design, security, “big data”, mobile devices and more. Questionmark keeps spending around 25% of revenues on product development. The huge demand for online assessments is making this our busiest time ever, and we expect continued, rapid improvement. I’d like to thank our customers, suppliers, partners, users and employees – whose support, collaboration and enthusiasm have been critical to Questionmark’s growth during our first 25 years. I look forward to continuing the journey and am eager to work with all of you to shape what happens next!